When you’re on a budget, above ground pools are an ideal option for homeowners who wish to add this time tested recreational tool to their backyard scene. You get all the benefits of an in-ground pool without the everyday hassles and expensive upkeep costs. Your hot summer days will never be dull again with a selection from Bestway. These designs tend to be heavy-duty and reinforced for durability and longevity. High-quality products are used to produce a product that not only lasts but is cost-effective. They are also easy to assemble which saves time during setup and disassembly. This company has over 20 years of experience under their belt, and they consistently produce a wide selection of products to appeal to their growing range of consumers. These 6 pools have the most to offer when it comes to size and convenience. Find out why these market toppers are the best in this Bestway above ground pool review. This high-quality inner liner stands up to heavy-duty wear and tear. The quality to price ratio on this item is excellent making it an affordable choice. It is easy to assemble which adds to product convenience. Accessories included in the product kit such as ladders etc. may not be as durable as the frame and other fixtures. The Bestway pro frameset is a great choice for persons with families as it can stand up to both the elements and heavy wear. Its frame is constructed from rust-resistant steel and it is easy to install with the hardware included in the product kit. This 12-foot pool has room for adults and children to play. There is a slide to keep kids occupied for hours. It may be difficult to empty this pool. The H2OGo dual family pool has a built-in slide that will keep the kids occupied for hours. The two in one design has an area separate from the kids’ section where adults can relax and cool down while the children are at play. This product ships on time allowing you to plan for its receipt and installation. The filter included in the product kit can be used with both salt and chlorine. The high-quality products used to construct this design is durable making it a great choice for an affordable price. The ladder included in this product kit may not be as durable as other fixtures included in this product kit. 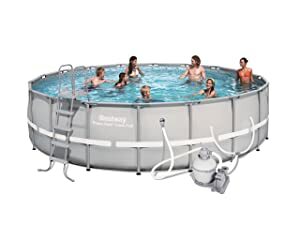 The Bestway power steel pool has a polyester mesh core that is protected with 2 layers of laminated PVC for increased strength and durability. This product can withstand extreme conditions which include continued exposure to ultraviolet rays and chlorine. This product ships quickly decreasing the time you have to wait to receive your purchase. It is easy to assemble and all necessary hardware is included in the product kit. The sand filter that comes with this model allows you to use products other than chlorine such as salt. The cover that is included in this product kit may not fit well and can easily tear if snagged. 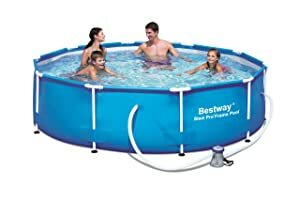 The Bestway power steel pool (with filter pump) is 18 feet long and a great choice for fun with the family. It constructed with PVC and polyester on the outer wall and a metal tech liner in the frame. This pool is quite versatile and can be used for pets such as dogs to play or get some exercise in. The pool is shallow and ideal for young children, however, it is large enough for adults to fit comfortably. This brand offers a wide variety of accessories that can be used along the with the pool itself. The quality control on this particular product may be low as some users may receive faulty parts. 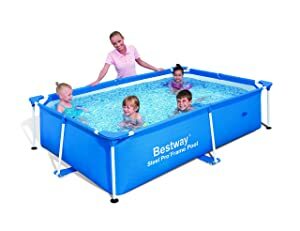 The Bestway splash pool is 94 inches in length and ideal for yards with limited floor space. It is quite shallow and incredibly easy to assemble. The PVC and polyester used on the outer wall add durability to the structure. The rigid frame of this product reduces water loss from splashing allowing the water level to be maintained while in use. The straight walls give the appearance of a wider more spacious surface area. Accessories such as ladders and covers can be acquired easily through the manufacturer or online. The filter included in this product kit may need to be upgraded. 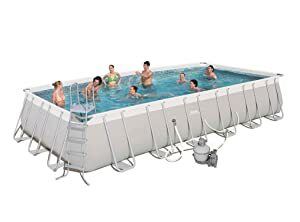 The Bestway power steel above ground pool has a strong steel frame that is made from 3 ply reinforced metal. The mesh core is encased with laminated PVC to maximize durability with a 330 GPH filter pump included in the product kit. These types of pools tend to be smaller than in-ground pools however this brand carries pools that are between 10 and 18 feet in size. This allows users to accommodate their entire family making use fun for children and adults. They come in various shapes and the larger sizes have additional fixtures such as slides and filter pumps that may be included in the product kit. At 90% capacity, most of these pools can hold at least 500 gallons of water. This may require an upgrade on the basic filter or pump that comes with the product kit. These accessories are easy to acquire and can be obtained through the manufacturer or online. No one wants to spend their entire day setting up their pool only to have limited daylight left to actually enjoy it. This brand makes their designs easy to set up and include all the hardware needed in the product kit. Frames are easily attached in a “T” creating a sturdy foundation that can withstand the weight and wear. Some designs come with a flow control drain valve that makes it easy to empty your above ground pool when it’s time to dismantle and pack it away. A basic 330-gallon filter pump is commonly included in these product kits along with a repair patch. The filter pump in some of these pools models can get as high as 1500 gallons, depending on the size of the pool. 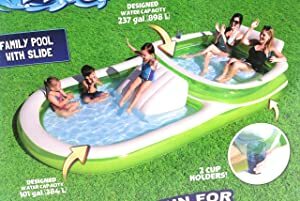 There are some models that come with cup holders which allow you to relax and enjoy your time in the pool with a few drinks. This feature is quite popular with adults who plan to enjoy themselves while their kids play on the other side of large double-sided pools. The drain valve can sometimes be attached to a garden hose which will allow users to easily drain the pool after use. Accessories for these types of products may include chlorine tabs and solar covers. This helps to shield the structure from ultraviolet damage and chlorine damage which increases the product durability and longevity. Heavy-duty materials such as PVC and polyester is used in most cases to construct these products. These materials are not absorbent and allow the structure to dry quickly after use so it can be packed away for later use. The PVC can be laminated for increased durability and is generally used to encase mesh core liners. PVC is a very strong, heavy-duty plastic that can withstand a high level of wear and tear. 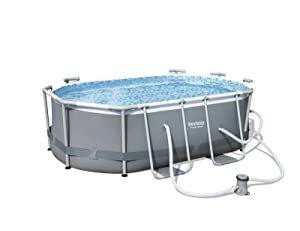 It is also a very good load bearer which allows the pool to bear the weight of gallons of water when filled to capacity. It is also highly resistant to water and chlorine damage as well as ultraviolet rays. The metal frames of a great majority of above ground pools can also resist rust and other environmental damage such as ultraviolet rays and chlorine. The walls of these structures are generally three-ply and the rope included may be reinforced to keep the foundation stable when in use. Mesh cores are designed to improve breathability which enables this product to dry quickly after use. This allows users to quickly disassemble the structure and pack it away for later use. This type of core is soft and padded for comfort during play or relaxation. Above ground pools from Bestway is a great option for persons on a budget that may have some space in their yard. You can stay cool and have some fun when the temperature rises with large pools for the whole family or smaller pools just for the kids. The smaller more shallow pools can be repurposed for use by pets such as dogs, ducks and even fish. The larger pools generally have an area for kids and parents and can come with slides and other fixtures. They have accessories such as filter pumps, solar covers, and ladders that can be purchased separately for your convenience. The materials used for construction are strong and durable being reinforced for increased durability and longevity. These pools are designed to last and will make a great addition to the home of anyone who is looking for a little extra time in the sun.